GG, Sweet Bratty Niece and I survived LakeFest '08. That was an interesting new event with lots of vendors (80+) and we found being a food booth an eyeopener. Now rested up after working 30 hours over this weekend's two day event, it time to move on to the next event! 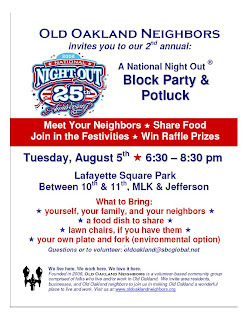 National Night Out is celebrating it's 25th anniversary this year and Old Oakland Neighbors (OON) is excited to host our 2nd annual community celebration at Lafayette Square Park. The yearly event is sponsored by the local police department and is officially called "the nation's night out against crime." Statistics show that when neighbors know each other, crime goes down. We had a 100+ attendees last year and hope to meet many more new neighbors and friends this year. Old Oakland Neighbors is a grassroots community group that welcomes everyone that lives, works or just loves it here. As the co-chair and social coordinator for this group, I cordially invite you to attend our celebration. It's a potluck, bring a dish to share. OON will provide drinks, games and some raffle prizes. Come out and join us!